Transcription of a letter from the Amos Adams Lawrence Collection, Massachusetts Historical Society.Charles Robinson wrote from Kansas Territory to Amos A. Lawrence in Massachusetts. 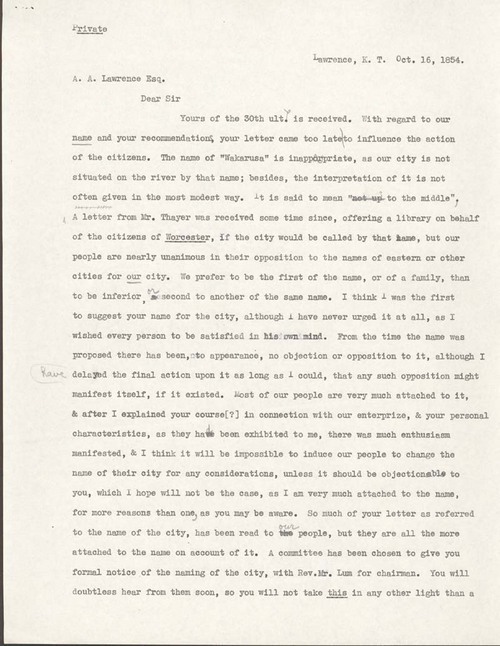 Robinson recounted to Lawrence the recent discussion of the new settlement's name, believing "Wakarusa" to be inappropriate and rejecting the names of Eastern cities already in existence. There appeared to be unanimous support for the name "Lawrence", which had fallen into common use, though it had not been officially adopted. Robinson advised Lawrence that a naming committee would be in contact with him soon to give him formal notice of the adoption of "Lawrence" as the settlement's official name.